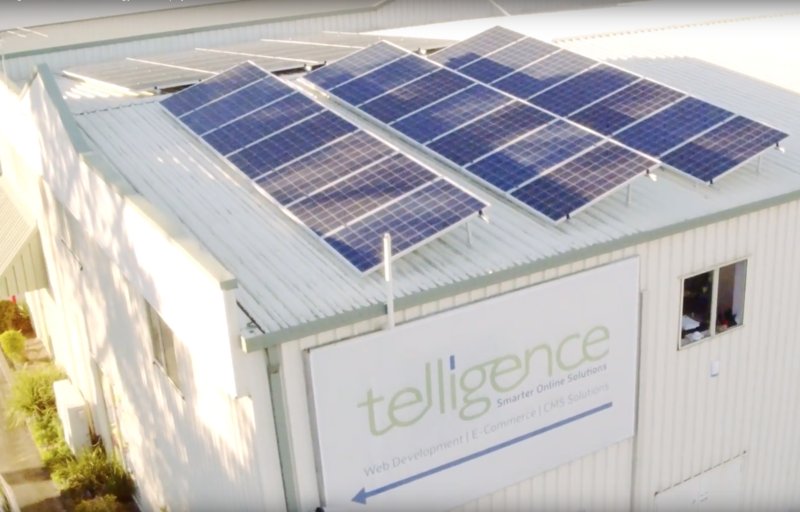 Telligence and our hosting division Austiger Hosting have made a commitment to Step Lightly on Our Planet and at no additional cost to our clients. It is our goal to ensure that in providing services to our customers our net impact on the environment is positive. We provide 100% Rewnewable powered Website Development and Green Web Hosting! The team at Telligence recognise that the IT industry in general and in particular hosting environments contribute significantly to greenhouse gas emission due to high electricity consumption. So we decided to do something positive about our contribution to the environment! Our offices has a 15kW solar array that generates more power than we use. We've completed a whole of company vehicle replacement program that involved the purchase of electric vehicles. We've implemented waste reduction strategies including the minimisation of paper and other waste resulting from our business activities. Recycling and the use of recycled resources where possible is now core to our corporate culture. We've implemented strategies to reduce our energy consumption in our offices that include turning off equipment and lighting not required and only leaving on critical equipment out of business hours. We are measuring the results of this and have seen more than a 25% reduction in our weekly electricity consumption. Where possible we utilise teleconferencing and electronic contact mediums for client contact to minimise the use of printing, vehicles and flights. All flights will be offset directly with the airline or via purchased carbon offsets where direct offset is not possible. Please keep this in mind when you want to meet with us! Energy efficiency and the supplier's/manufacturer's credentials and environment efforts are now a key part of the decision process relating to asset and other purchases. Generally, if you are looking at your own business' environmental impact you don't need to account for anything to do with services we provide to you, we've already done it and at NO additional cost to you! All PowerSites clients can enjoy the fact that the hosting of their website and the support services we provide are carbon neutral as can AusTiger Hostings clients. We won't be asking you to contribute, if you feel you want to, then implement a program in your own business and we'll all be winners! If you have any ideas or suggestions that will assist us in our efforts, particulary as it may relate to dealing with you please feel free to contact us! As part of our research we found some fantastic information on the impact climate change is having on the environment, what businesses can do to offset and reduce their emissions and also what you can do personally to reduce your environmental footprint.